Inevitably, BREXIT has one way or another touched all farmers in Kent, or rather the uncertainty over the outcomes when, or even if we BREXIT. The weakness of Sterling has not only influenced the value of our imported inputs, undermined our sales and hit exports, but is affecting that other big talking point in Kent, access to EU labour. The weaker Pound has made seasonal working in the fields of Kent just that bit less financially attractive. Couple that with the uncertainty of whether or not work permits will be needed in the future, or available in sufficient numbers, and the result is an EU labour force that is looking nearer to home to secure longer term employment in the future. We’ve all seen the long lists of ‘Wants’ and ‘Needs’ post BREXIT, circulated by all sides of the rural sector. The implications of BREXIT will be wide ranging for all of us, across all sectors and the outcomes will impact on all of us, positively and negatively. Mr Gove, and DEFRA, is grasping the opportunity for a Root and Branch reform of Food, Farming and the Environment without the need to have an EU wide ‘one size fits all’ policy that has been the downfall of the attempted EU reforms over the last 20+ years. To try and move the debate forward, I think back to the NFU slogan from not so long ago, along the lines of ‘Produce More, Impact Less’. Sustainable farming has got to be in the national interest, embracing food production, the environment, and the wants of a more socially aware and connected public. But has DEFRA currently missed the importance of food in the equation? Elsewhere in this AGM Report you will read about the forecast population growth in Kent and across the whole of the UK. The easy option of importing food to meet this demand is increasingly going to be a problem with Countries such as China land-banking around the world, needing to secure food supplies for reasons of home political security. 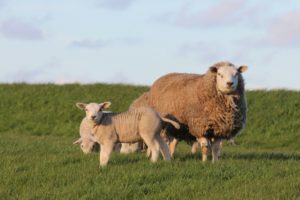 Where once the UK would be the market of choice for New Zealand lamb, other markets nearer to their home may offer easier and more valuable access in the future. Our supermarket shelves may be forced to be less populated by products with ‘food miles’ in the future, not a bad thing as long as more local food can be sourced. The cheap food policy that we currently operate under will need to change to secure home grown supplies. Home production will need to be uppermost in DEFRA’s thinking if we aren’t to store up problems in the future. The consumer is going to need a habit change, to recognise the true value of food, and the importance of local. But for our part, we need to recognise the significance of Mr Gove’s thinking of public money for public good. Sustainable high welfare food is one possible route for UK farming outside of Europe, but it needs to be built on a long-term partnership between the consumer, the producer and the Government. The danger for all of us in food terms is if Government is prepared to let UK Farming go the way of the coal, ship building and steel industries, in favour of short term ‘wins’ from the likes of the financial sector, under pressure from the Treasury to justify every penny of public spending. Closer to home, in Kent water continues to have a big influence on Farms and Farming. After a run of two dry Winters in 2015 & 2016 and the initial 2017/18 Winter looking dry, the threat of hosepipe bans was real for the Summer of 2018. But the first three months of 2018 proved to be some of the wettest on record, bring much relief to the Water Utility Companies. For residents in mid Kent, the significant Bewl reservoir had reached a record low level in November 2017. By March 2018 the Spring recharge saw water levels at 100%, the first time in many years. The continuing wet and cold spells through the Spring meant that by mid-May all five of the Medway and Rother fed storage reservoirs were still at or near to 100% full, significantly above the long-term average. This is good news for growers of irrigated crops in Kent, with groundwater levels in May all ‘Above Normal’ or ‘Notably High’. Of course, with the diversity of crops grown in Kent, this weather hasn’t been good for all. The cold Spring has delayed planting and growth on salad crops, and straw prices are forecast to be high this season due to shorter than normal arable crops, held back by the cold weather. But water availability is also having an increasingly positive effect on land prices. Bare land prices have been rising in areas like the Greensand Ridge. Where once the ‘always running’ natural Springs were a curse for combinable crops, they are now an asset for the Winter fill water storage schemes under pining the resurgence in soft fruit crops in the Kent fruit belt. A few generations ago these springs would have been mainly useful for livestock troughs and perhaps a few novel Water Cress beds. The earlier reference to population increase in Kent brings up the subject of Planning and the inevitable effect on land values, be it from development sales or Roll Over money. Class C Permitted Development Rights have been a windfall on some farms, with hopefully the money reinvested in farming, or the currently more profitable Diversification, based on the adage of Location, Location, Location. With an ageing farmer profile and the effects of the BREXIT uncertain, is this a good time for New Entrants? Is now the time that enthusiastic new blood could find an opportunity that the previous era of high rents on the back of EU farm support payments denied them? Schemes such as ‘Restocking the High Weald’, that looks to match-make between graziers and landowners, can only be a good thing. A positive note to end on.